Hi Beautiful People and so sorry I didn't get a chance to post on yesterday...so let me start by asking how was your weekend. Mine was nice and as always...it zips by! So, I had a mini photo shoot with my girl Ali...love me some Ali.....and I got to wear this cute yellow dress...and it has pockets.....from Banana Republic....it's actually called "Drape Back Dress" and the color is gold...but I'm saying "That Yellow Dress Though"! I thought it would be fun to pair the dress with my blue suede shoes from Steve Madden and I got these cute BaubleBar Beaded Hoop Earring in turquoise from Target! Now back to the fashion.....don't you just love this dress y'all...it's so simple....yet so chic and I'm seriously feeling a little sassy in it....YASSSS! 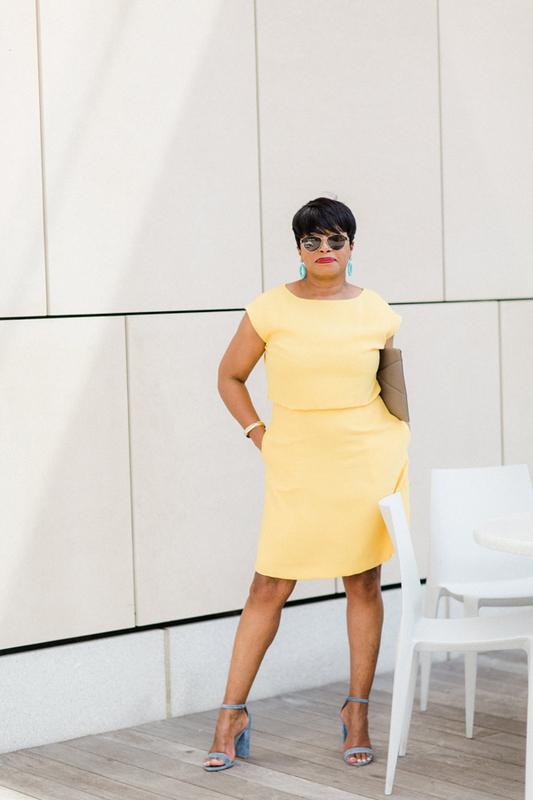 I also love pairing it up with the blue...the perfect pop of color for the yellow! As Ali and I were leaving, we spotted this scooter (vapor) and you know we had to capture a picture of me standing by it....so cute, right!